Ideally, cDNA should be obtained from the laboratory that first cloned the protein of interest. Search the literature for the primary reference, and take note of the accession number reported. If cDNA cannot be readily obtained, consider obtaining it from a cDNA library made from an appropriate tissue and species. As a last resort, cDNA can be obtained from cell lines or animals (with or without a particular treatment) by reverse transcription of isolated RNA. SuperScript™ III First-Strand Synthesis System for RT-PCR (Invitrogen; www.invitrogen.com) is a comprehensive kit for cDNA synthesis from RNA templates. 1. Obtain cDNA encoding the protein of interest. 2. On the NCBI website (www.ncbi.nlm.nih.gov), search the "Nucleotide" database for the protein by entering the accession number. Download the sequence to MacVector or DSGene software (see Note 1). 3. Determine the sequence encoding the protein moiety to be included in the Fc fusion protein; this portion is referred to subsequently as the "target" (see Note 3). 4. To construct N-terminal fusion proteins, search the target sequence for HindlW (AAGCTT) and BsiWI (CGTACG) restriction sites. 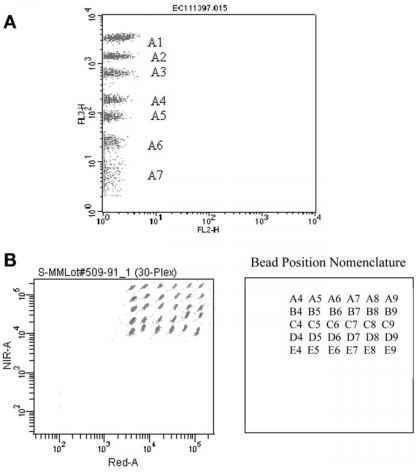 If these restriction sites are absent from the target sequence, design PCR primers using the templates in Subheading 2.1. (see Note 4). 5. Order primers from an institutional core facility or online from IDT (www.idtdna.com). Resuspend primers at 10 pmol/pL. Fig. 2. Agarose gel electrophoresis of murine Fc (muFc) PCR product. Lane 1, 100-bp DNA ladder. Lane 2, negative control (without template). Lanes 3-5, triplicate muFc PCR reaction products ("muFc"), resolved as single bands approx 750 bp in length. The higher-MW pSK/muFc vector ("template") is faintly visible on the gel. 2. As a negative control, mix one tube containing all the previously listed components EXCEPT cDNA (see Note 5). 3. Place tubes in a thermal cycler programmed as follows: 5 min at 95°C; 30 cycles (30 s at 95°C, 30 s at 55°C, 30 s at 72°C); 7 min at 72°C. 4. Mix 10 pL from each PCR reaction with 2 pL 6X glycerol buffer, then load onto a 1% agarose gel in 0.5X TBE buffer and run at 100 V. Include 100 bp DNA ladder to verify PCR product size. 5. Clean the viewing surface of an UV transilluminator with 10% bleach; dry thoroughly. Visualize target PCR product (which should appear as a single band of correct molecular weight) and excise from gel using a sterile scalpel. 6. Purify target PCR product using QIAQuick Gel Extraction Kit. Store at -20°C.